Italy will be going all out in the 2011 World Cup hoping to make amends for their failures four years previously. The 18-16 defeat to Scotland in St Etienne remains a painful memory for the Azzurri, as it condemned them to an early exit. Italy fly-half Edoardo Gori, who is set to make his World Cup debut in New Zealand in September, said: "Most of my team-mates told me that the 2007 experience was one of the most painful of their lives." One of the players that endured that defeat is veteran flanker Mauro Bergamasco. "It was a huge disappointment for us and it was a pity for me as the 2007 World Cup from a performance standpoint was my best ever," he said. A fractured rib against England had limited Bergamasco's 1999 World Cup to just a few minutes while in 2003, Bergamasco enjoyed just one start. France was the event in which he and his Italy team-mates fully expected to make an impact and while he made four appearances in the tournament, the results were not good. "I was very young in 1999," he said. "Everything happened very quickly. "I was called up then I had the injury against England that meant the end of my World Cup. In 2003, there were some problems with the staff but I still managed to play three games." The 32-year-old Bergamasco, alongside veteran prop Andrea Lo Cicero, is the most experienced players in the Azzurri squad and the two will compete in their fourth World Cup in New Zealand. "The path we have followed in the past four years has been the right one," said Bergamasco. "The team has matured a lot from St Etienne to today. "We are a solid and experienced team. Moreover, in the past 12 months, there have been young quality players that have emerged. I truly believe that Italy has never performed as well as it is doing now. "We have taken giant steps in recent years but we cannot stop here." Included in Italy coach Nick Mallett's group are 14 players who will be making their World Cup debuts if they feature in New Zealand. "This group is the result of four years of work," said Mallett, who will be replaced by Frenchman Jacques Brunel after the tournament. "We have no doubt that those that have been chosen are the best possible to compete in the World Cup. We will go to New Zealand with the best team possible and we have no doubt that the quarter finals will be within our reach." The Azzurri have never progressed beyond the group stages in the World Cup and are in Group C along with two-time champions Australia, Ireland, Russia and the United States. They have shown plenty of improvement and the highlight performance of this year for the Azzurri was their historic triumph over France in Rome in the RBS 6 Nations. Mallett's men came from 12 points down to beat Les Bleus 22-21, the Italians' first triumph over France in the competition. Bergamasco had to watch that game from the stands at the Stadio Flaminio as he was ruled out for the entire tournament with a right shoulder injury. "It was a great victory," said Bergamasco. "Everyone played a perfect game and that win was proof that when we play well, we have a chance against anyone." Italy had also put in a solid performance against Ireland, a team they will meet in the group stages of the World Cup, in their Six Nations opener when falling 13-11. "It was important to play well against them because they are a team that we will face in New Zealand," said Bergamasco. "But I believe Australia are favourites in our pool." 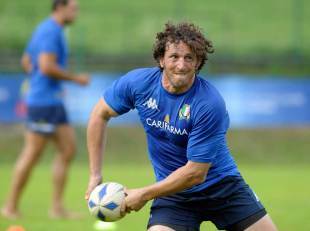 The return of Bergamasco is good news for Mallett and for the Azzurri. "Robert Barbieri, Paul Derbyshire and a veteran like Mauro Bergamasco guarantees us presence and confidence on the pitch," said Mallett.